I get a special tingle in my soul this time of the year! Do you? Advent is my absolute favorite liturgical season. Wait, is that not the season you expected to hear about? Because I know that many of us (mostly born Lutherans) love Advent, and most of the world either doesn’t know what Advent is, and doesn’t care, even finds it a downer. I’m totally sympathetic to both points of view. Advent is the time of year before Christmas when we prepare for the coming of Jesus. I love the way it is full of God’s promises, and encourages us to long for a just world. Advent asks us to examine how we celebrate, worship, and it calls us to prayer and good works. This is a good antidote to the crazy, busy, consumerist way our culture tells us to celebrate “the holiday season.” The longing for God’s incarnate presence is central to my own spiritual life. Many of us in our Lutheran tradition observe Advent by refraining from singing Christmas carols until Christmas Eve, not decorating the church right away, and spending extra time together on Wednesday nights (both praying and eating simple soup suppers together). Our worship is a little restrained, contemplative. But my soul is torn- as much as I love Advent, I also know that during the month of December, we get more visitors, but almost none of them come back. My heart breaks to think that there are people who come to us looking for some of the hope and joy that the shopping malls promise this time of year (but can’t deliver). And we know that our faith can bring that hope and joy, but somehow the way we celebrate Advent doesn’t share God’s grace with them. Here’s the central tension at the heart of all worship planning: how do we create worship that honors the treasures of our tradition, and speaks to our culture today? I’m really wrestling, this year, with how to make our Advent traditions speak to people who walk in our doors expecting Christmas. The worship committee, our Music Director, and I have all been working hard on this, and I hope you help us with it too. I think our worship services this December will be beautiful, welcoming, full of hope, and true to the meaning of Advent. Our Music Director has arranged music for us that I can’t wait for you to hear (our liturgical words set to some of the more haunting, wishful Christmas tunes) and I love our plan for gradually decorating. On Wednesday nights we’ll have lovely prayer services, designed by Victor, and highlighting reflections from Grace members, followed by dinner together. 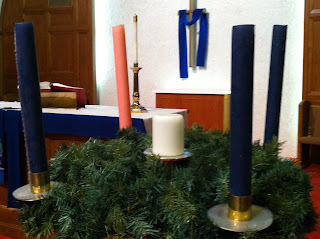 And of course, we’ll have our Candlelight Mass services on Christmas Eve, at 7pm and 10:30. Dear people of Grace, God promises to show up among us. And this December, I have no doubt that we will feel God’s presence in the body of Grace Lutheran. You are part of the wonder of this season for me.